About 65 horses are brought together. Not just normal horses, racing horses for the Endurance. They come from everywhere. Pure Arab breed, Bedouin horses, horses of the stables of princess Alia, some horses from France, Austria, the Emirates, Bahrain. All distances are available, 40, 82 and 129 kilometer. I’m invited to follow Bader, stallion, a purebred Arabian. He is 5,5 year now and just starting Endurance. It is his first time to ride in the desert. He is very curious, adventurous and happy in the sands. However, Majd, Bader’s rider has already ridden our horses in the desert before, and he was very curious how Bader would behave in the desert. Bader starts the 82 kilometer. He ran the 40 kilometeres twice before, he was in the prices, one time second and one time first. Now he needs about one year to qualify himself for the international Enduraces of 129 kilometers. Tuesday, before the race on Saturday I meet Majd Kh. 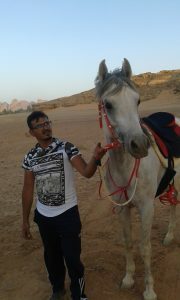 who just came from Amman with his horse Bader. Majd has Bader and will also ride him in the upcoming race. I also meet his family for a cup of coffee in the camp. 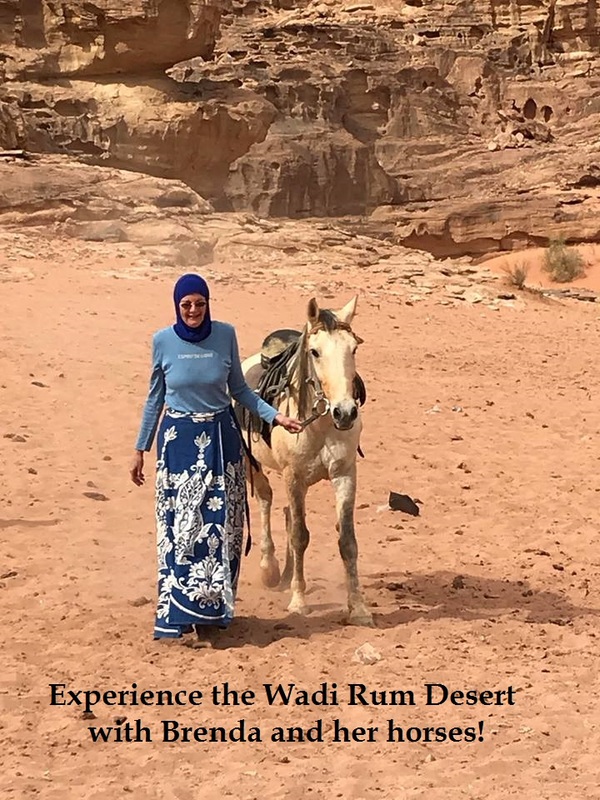 Majd rode on our Bedouin horses before, even my horse Barq, who I hardly trust with anybody else as he is a stallion and very passionate about riding in the desert. 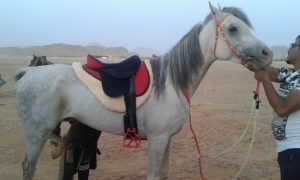 Especially with other horses around he wants to show himself as a real stallion, ruling the desert. Majd has grown up around horses, he doesn’t even remember his first encounter with a horse with his father, maybe at the age of 3. Horses are part of his life. In Amman he is training and riding horses, he spends his free time in the stables surrounded by and riding horses. Wednesday he makes his first tour on Bader through the desert. It is a hot summer day and they choose to start late when the temperatures are better. After the sunset they arrive at the camp with Bader, my first meeting with this awesome horse. I’m stunned to see such a beautiful and handsome boy. Let him sniff my hand before I approach him. But he wants to approach me as well and let me pet him and hold him close to me. I want to make some pictures. Once I take my phone out he is following me with his eyes to be sure his pose for the camera is the best one. We’re laughing because he acts like a model, who loves to be in the spotlights. Thursday I visit the stables built in the desert to see Bader and his competitors. 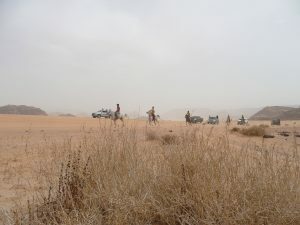 I’m too early, Bader and Majd are still enjoying the desert, and I wait for them at the place of the farrier. The farrier checks Bader’s hoofs and shoes and everything seems well, Bader knows how to behave perfectly. As Majd’s cousin Rezeq already has left, Majd, Bader and me start walking to the stables deeper inside the desert. The temporary stables are built behind the starting point of the Race. At one point during our walk in the dark Majd is asking me to ride Bader to his stable because he wants to improve his condition by walking as he gets spoiled with big healthy meals at his cousin’s home in a village close by. I tell him that for me it is no problem to walk if he wants to ride Bader. No, he insist that I should ride Bader, he tells me he knows how I ride my horse Barq and trusts me on Bader, while he is curious how Bader will react with someone else on his back. I’m so excited to get on Bader. I feel his tension and excitement. But after a few steps he is quiet, at ease and walks with me on his back next to Majd. He knows his way to the stables after sunset. Before he gets there he announces himself with his voice, the others are answering and he gets more excited to run to them but he stays calm as long as I’m on his back, and I’m telling him he will be there in a minute. Majd takes him after I dismount and Bader starts to talk louder. He’s happy to be back with the others. He gets his food while we sit to watch him enjoy his food. Majd introduces me to other owners and their horses. I see many mares and stallions, some Arabian, some mixed. Some nervous some at rest, some approachable, some turning around in their stables. I see the owners, the same story. Some have grooms to take care of the horses, some do everything themselves to make sure their horse is in the best condition during the race in two days. Many horses are treated with henna, on the legs, the tail, the place of the saddle to protect them from evil eyes. Henna also has the name to be good for the skin. Bader is without henna, although he is so beautiful to see. 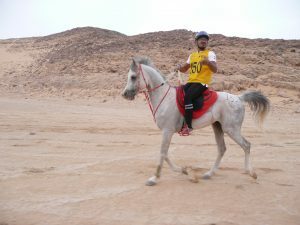 Majd is proud to ride a pure Arabian horse, he worked himself up between the horses in a natural way. Majd is very relaxed and easy going with horses. He sings and talks while he is busy during grooming or riding. He constantly checks if everything is okay with Bader’s skin, his legs, his tack. Even if someone else is helping him to saddle Bader he always has the last check, and will ask Bader if everything is fine with him. And Bader is happy he is so involved with everything around him. He’s a man’s best friend! 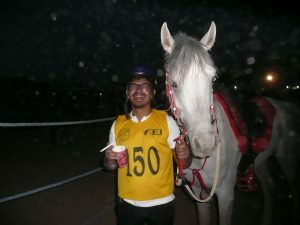 I ask Majd why he choose for Endurance rather than another discipline in horse riding. “In Jordan only Endurance is on a level to reach something in equine sports. Dressage and jumping are still at a very low level compared to other countries”. “Even horse gear is not easily available compared to the large assortment abroad. But we make something of what we do have and are very inventive”. Does your religion play a role in how you view horsemanship? “Our Prophet Mohammed taught us how to behave with horses and other animals. That a horse is a noble animal. Many horse owners even go a step further, they put a horse before family and will take care better of their horses than their family. We might starve but will never let our horses starve. This is even mentioned in poetry. Keeping this in mind you’ll see most Arab horse owners keep and treat horses differently as in the west. We want our horses to have a happy life, we feel what a horse needs, we treat our horses in a gentle way and work as a team, they’re part of our family”. Unfortunately I have seen some different things happening to horses, when I visit the stables on Friday and also earlier with other horses in Petra and the deep scars on our rescue horse, I will never forget. “There are people having horses but unaware about how to treat them well. If one cannot take care of himself properly, how can he treat a horse well, and understand what a horse needs?”. Majd looks angry when he tells me this while his eyes turn to Bader and getting the softness as when you talk to a baby, within his eyes again. He pets Bader on his neck and manes. I see pure love for his horse. The day before the Endurance Majd and his cousin left because something was broken in the car, that needed to be fixed. I asked if it was okay to visit Bader, the answer was yes. Majd seemed happy that I went to Bader so he would not be alone. The atmosphere was a bit different when I visited alone. It was no problem to walk in as everyone knew me already, they even brought me a chair to sit with Bader. The next day is the day of the race. The horses have had their check up with the veterinarian. Bader was approved to start the race, didn’t need any extra care. But some horses needed infusions with vitamins and salt solution. I learned that this is all done by the owners and grooms. But when one mare, in my eyes a bit nervous as her eyes looked frightened, but standing still while they tried to bring in the needle, was kicked in her stomach, I was disappointed and got angry. Was this a trick of a competitor or was it just to make the mare scared of him to let him put in the needle? It left me confused. It’s not my way of treating horses. Even if a horse is not cooperative during treatment there are many tricks to get done what is necessary. It’s 4 am. when my alarm rings. I have arranged that someone will bring me to the race early, which starts at 6 am. Before the horses and riders are ready. It was still dark when I arrived. Majd and Bader where happy to see me. Rezeq was busy to make coffee on a wood fire and arranged the paperwork, someone else saddled Bader while Majd made himself ready. I stayed with Bader, helping with the saddle. Bader was excited but relaxed, trying to find something to chew on after his breakfast. Majd was laughing, the big day arrived, he could ride the first 82 kilometer with Bader. He told me this was just a test how Bader and him would do, he would like to win but it was not the goal. Just to see if they both would be in a good condition to continue to the international Endurance races. Everything in the endurance is going on a personal time, no racing against each other. The course for the 82 kilometer is divided in three parts. 31, 31 and 20 kilometer in different tracks, visible for the riders with different colors of flags along the trail. Between and after there is a check by the vet who looks at the condition of the horse. As a rider it is important to keep your horse good at all time during the race. If you start too fast the horse will be exhausted by the time you finish the first trail. In endurance it’s not only to end as the first, if the vet doesn’t see the horse well after ending the race he will disqualify the horse and the rider is going home with nothing. It’s time, Majd can start, after a last check and cleaning of Bader’s hooves. I jump in the car with Rezeq and others to follow Bader. Majed starts quietly with trot and walking. He is singing and smiling on Bader’s back. We join in with his songs from the car. He even takes time to pose for pictures, letting others pass him. He is told where the princess is riding as we pass her and her following persons and cars but Majd continues in his own rhythm. The sand is soft which makes it hard for the horses to move fast. It’s cloudy, the sun doesn’t break through the clouds yet but it’s light enough. The day before, a sandstorm came up in the aftenoon but this morning the weather is quiet with hardly any winds. Majd is not in a hurry. When we arrive at the first water stop Bader doesn’t need to be refreshed, Bader even doesn’t drink as this part was not more than just a warming up. The next part Majd is mixing between trot, walking and some canter but not too much. He tells me he wants to build up the Endurance race to have good marks from the vet. Before we know it, the next water stop is already visible, and we already passed a checkpoint to write the number 150 of Bader and Majd in the papers. This time Bader is dunk with water to cool down. The sun is playing shine and hide behind the clouds. Meanwhile the sand is getting better to canter on and Majd starts to ask more from Bader, to be back in time for the first check up with the vet. In total there are four points with water. Bader starts to drink and enjoys the water showering him. Back at the starting point Bader is doing very well, the vet let him pass to the next trail of 31 kilometer. Half an hour rest, Bader eats some barseem, hay and we avoid letting him eat barley as this leaves him too full for the next part. Time to start again, a new trail to the east. The sand is heavy but wherever possible Majd is cantering. We meet many other riders but everyone has his own rhythm. Majd knows to ride in the desert and we see him many times going next to the “road” with the flags to see the terrain in better shape, still making the same kilometers as on the appointed road. 2 waterstops are close to eachother. Now the sun is shining all the time and it is necessary to hose Bader with water all the time when possible. We fill bottles before he arrives to make the pit stop quick. The third part is a long distance before meeting another water point. We see by the speedometer of the car that this 31 kilometer are in fact more in distance, it turned out to be 35. 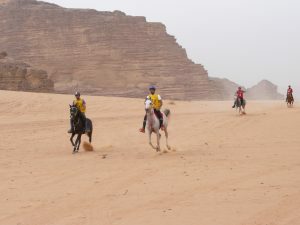 Majd starts to be a bit tired as the sand is since long very soft, he has to work hard on Bader to let him go in canter as the time is ticking away fast to be back in time at the start point. Even for us the distance is far before we reach the next water stop. Bader gets more showers as he needs to cool down. 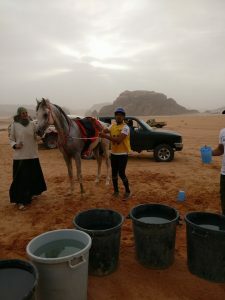 Between this water point and the next we see Majd only canter, he worries about the time. The last water stop goes quick again and immediately he canters on. 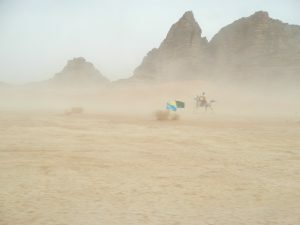 The wind starts to blow and the sand begins to move in dust clouds which makes the last part hard. There are more horses and all of them go fast to the starting point to get to the check up with the vet. Everything is fine with Bader following the vet check and they can rest and prepare for the last part. As Majd didn’t have his breakfast yet and time tells it is 11.30 am. already, I offer him some biscuits which he accepts. It seems he only thinks about Bader and forgets himself. Sandstorm! How to finish the last 20 kilometer? The wind is increasing, if we look at the desert, it is a hazy landscape, actually not much to see except the sand moving fast, blown up in the wind. We’re in the middle of a sand storm which doesn’t look good for the last 20 kilometers to start. But time is ticking, we saddle Bader for the last time, he is still relaxed, eating his hay and some barley, happy to be the center of many who care for him. This time I stay at the starting point as the car is full with others. I wave to them and see Majd and Bader moving into the mist of sands. Fingers crossed that he can finish the last part. The weather is not on our side, if you could choose you would not go out in a sandstorm. At the starting point the tents are blown in the air, the fabric tearing. None seems to care as life go’s on. Some horses arrive, some depart for their next trail. People covered with up scarfs leaving only the eyes uncovered are stepping on their horses to depart. The horses are still doing what they like, eating what they can find in the many baskets filled with hay and barley. 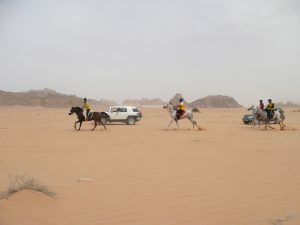 Abdullah arrived to take me back home, we make a round at the start point, seeing more horses. He knows some people when we arrive at the point where princess Alia has her horses. It’s a place with much activity, the sandstorm is still covering everything in clouds while everyone is just doing what he needs to do as if there was no sandstorm. All the time my eyes look to the place where Bader and Majd will arrive. We wait, it seems those 20 kilometers were harder than the two times 31 kilometer. 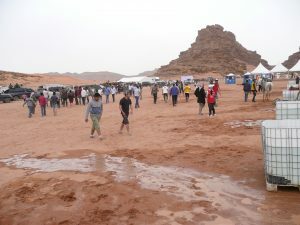 But there are Majd and Bader, we see them climbing out of the thick sand dust, 150 meter in front of us. First to the water to cool down, check Bader’s heart rate and continue to the vet. Coming back from the check-up I see the smile on Majd’s face, an A, the best score the vet can give. Bader is in a perfect condition, that is the best news of the day. We’re preparing to leave after I give Majd a present for Bader, because however he will finish (we don’t know yet as not everyone arrived) he enjoyed and did what everyone expected him to do while he is happy to eat his hay again. For me I wanted to express my enjoyment and to pay tribute of thanks to Majd, Rezeq and Bader was able to experience the Endurance from inside. 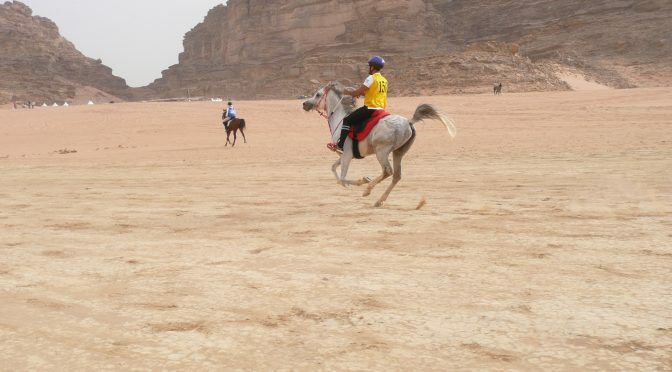 Now Abdullah tells me that he likes to bring out Barq, the horse I always ride, to the Endurance to see his other skills beside riding with me and our guests through the desert. A nice perspective to work on. Later, when the endurance is finished and we exchange pictures and videos I hear Bader finished 4th. Just one step beside the podium. But if anyone is surprised by a real sandstorm and still can finish in time, in my opinion all of them are winners. To be continued with the next race. Bader is now qualified to ride the next 82 kilometer race! And then, he can get ready for an international Endurance race of 129 kilometer.